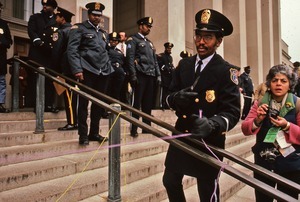 Arlington (Va.) - One policeman with a switchblade cuts the colored threads that the demonstrators have been weaving across the buildings entrance, while many other police stand guard on the steps and a photographer looks on during the Women's Pentagon Action. 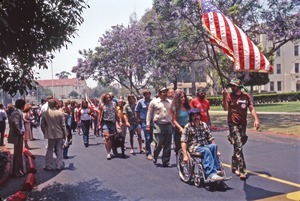 Brentwood (Los Angeles, Calif.) - Veteran Ron Kovic, author of Born on the Fourth of July, with a very sad expression is wheeled at the head of a demonstrators' parade with Veteran Gene Dorr by his side carrying an American flag to the Vietnam Veteran hunger strikers' encampment at the Wadsworth VA hospital. 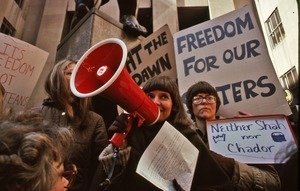 New York (N.Y.) - Gloria Steinem, partially obscured by megaphone, demonstrating in support of Iranian women, with the Atlas statue of Rockefeller Center in the background. Signs on posters read: "Freedom for our Sisters" and "Neither Shah nor Chador." 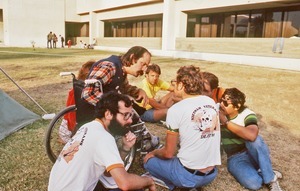 Brentwood (Los Angeles, Calif.) - Veteran Ron Kovic, author of Born on the Fourth of July, in wheelchair, leans over to talk to a group of others, two in foreground wearing tee shirts that read: "Vietnam Veterans…living under sentence of death" at the Vietnam Veteran hunger strikers' encampment at the Wadsworth VA hospital. Concord (Mass.) 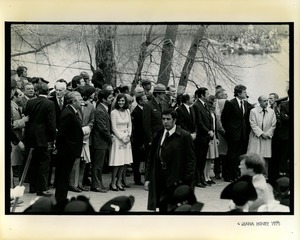 - McCormick, Dukakis and his wife Kitty, Ted Kennedy, Caroline Kennedy and Ed Brooke attend the Bicentennial celebration. 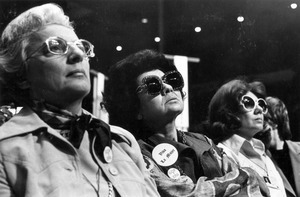 Pat Kerry, organizer of the torch relay across the U.S. from Seneca Falls to Houston, in front of the First National Women's Conference podium in Houston, Texas. 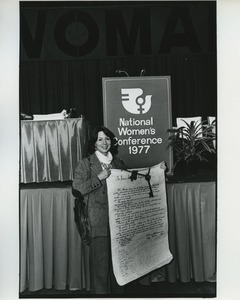 She is displaying a scroll bearing a statement written by Maya Angelou, "To Form a More Perfect Union" and signed by First Ladies and delegates as well as thousands along the torch relay route. 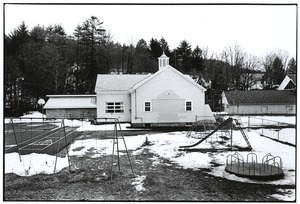 Ulster County (N.Y.) - A snowy playground behind a Town of Kingston one-room schoolhouse in Ulster County, New York. 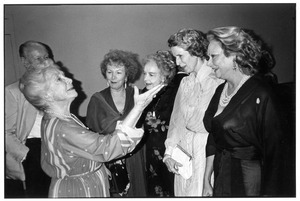 Helen Hayes entertains Sir John Gielgud, Nedda Harrigan Logan, Lillian Gish, and Mrs. John D. Rockefeller and Irene Worth at Lillian Gish birthday tribute, MOMA, NYC, September 18, 1980.